I’ve created my first digital mockups for the mini-comic. I was dreading this part of the project. I don’t have a working version of inDesign and Adobe products are expensive. 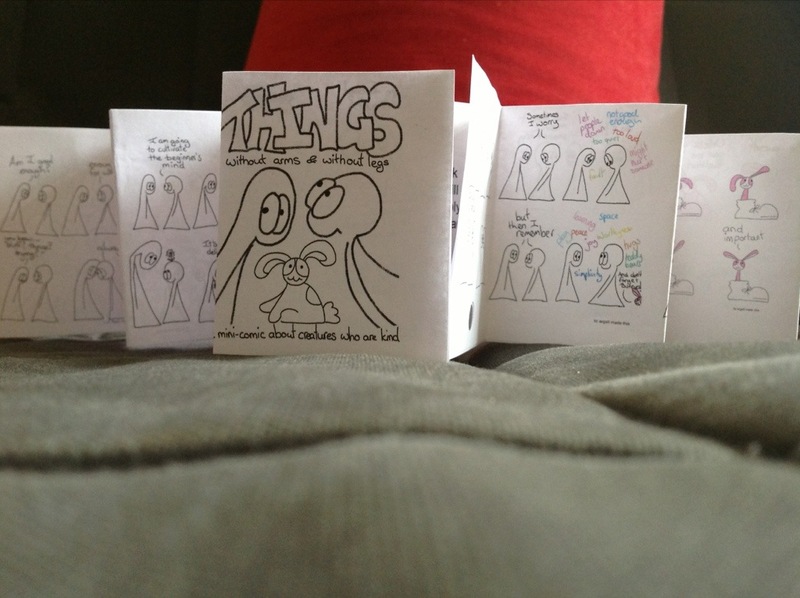 I screwed my courage to the sticking-place (after all I couldn’t waste all the time and effort people had put into voting I HAVE to create a mini-comic) and investigated the world of alternative software. I was prepared for something confusing and awful… GIMP may be fine and dandy on a linux machine, but on a mac it was a miserable experience. A quick trawl of the internet and wikipedia’s page on desktop publishing software led me to Scribus. I haven’t done anything super fancy with it, but thus far I’m really enjoying its simple elegance. I haven’t figured out how to create my own rulers, but I’m sure I’ll figure it out. 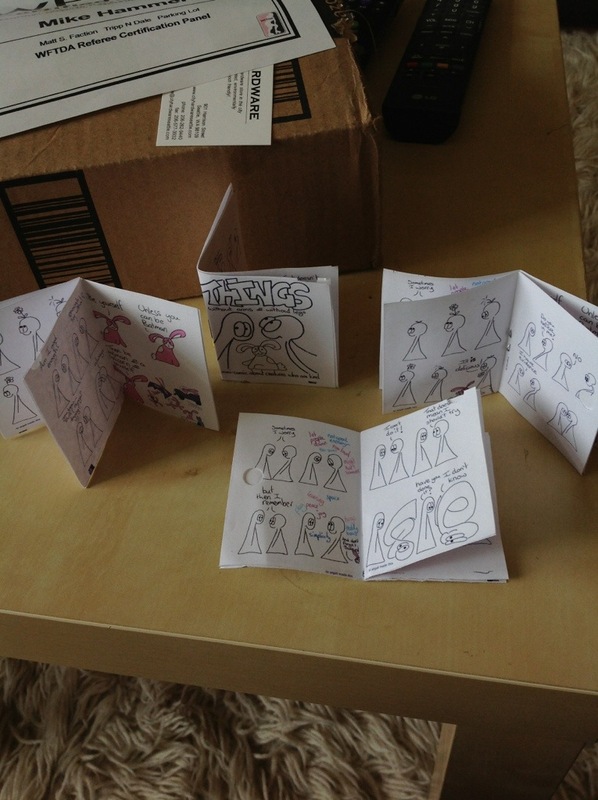 Here are the first printed mockups, accidentally in color. Alas, the final version will be in black and white. I don’t have a duplexer, so I glued pages together. AFTER I printed and assembled a page worth of comics I realized that I’d inserted the wrong flowering head comic (aka beginner’s mind). Fortunately that’s an easier thing to fix. From here I just have to write the back page and endlessly fiddle with sizing and margins. Then it’s deciding how many to print, deciding if I want to pay a printer for two cuts or do all the cutting by hand and filling any idle hour with a stapler and a razor to slash open the pages. I read on my phone on the way to derby practice that E. Catherine Tobler was having a competition on her website of the, it’s my birthday! Post a comment win a prize variety. I always feel shy responding to a challenge like that, like I’m taking advantage of someone, even though I know how thrilling and delightful it is to have people visit your website and say hello. I was drumming up my courage to post a comment when I noticed that she said, “Comment, drawing, free book.” Drawing, I can do a drawing! It is only now, as I write this blogpost that I realize that by drawing she meant the draw of, you know, prizes. Good thing I didn’t figure that out until after I’d done rough sketches of a bunch of steampunkian gothic pumpkin cats! I’ll finish them off as a comic later – if you want to see the sketches noodle on over to Ms Tobler’s website and enter the competition while you are there. Thank you for spending a bit of your valuable time with me. When I post an update and folks come over to read the latest. When someone stumbles onto my comic, starts at page one and works their way through. It’s the most amazing feeling. I often feel like a bumbling fool, figuring it out as she goes along and probably doing most things wrong. That I can be a bumbling fool of service makes me smile from ear to ear. Know that when a creator says every reader is important, they mean it. I certainly mean it, with all my heart. You are important, and thank you for popping by and spending a bit of time with the Things. We notice when you do (in an anonymous, website stats kind of way) and it makes us grin right down to our toes and/or ground contacting body parts. Liz, the Things, and friends. I have done NOTHING to optimize this website for search words and most of my content consists of images! People hardly ever find my website through google or similar thingies… so it’s always interesting to see what search terms do lead people to my website. It pleases me to no end that someone found my website through the search term “smiley face big toe.” Hello whoever you are or were, I hope you enjoyed my Things Without Arms and Without Legs! 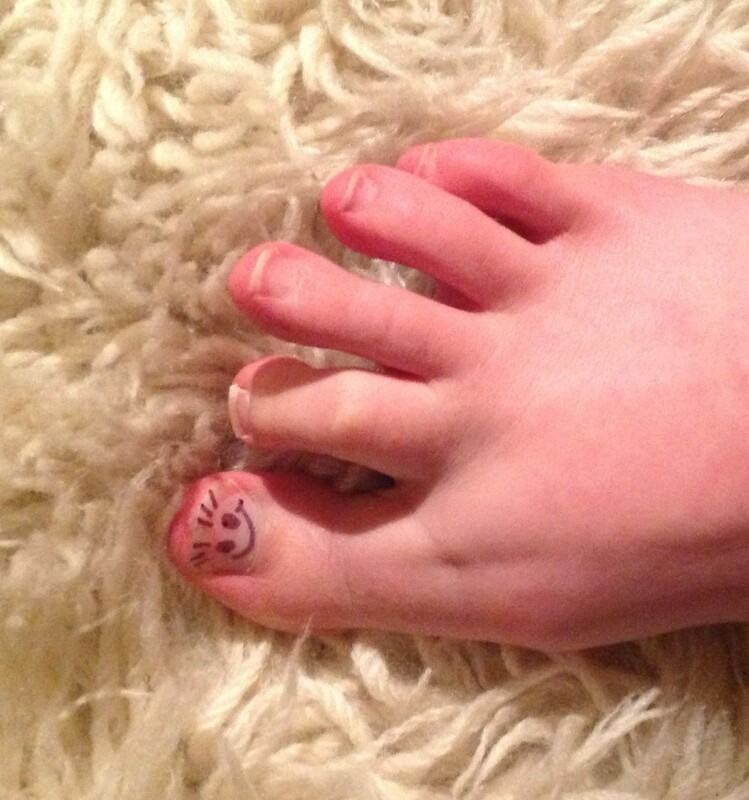 I know you’re probably disappointed, I only had one image of a smiley face big toe and that was a creative commons photo you may have already found on flickr. 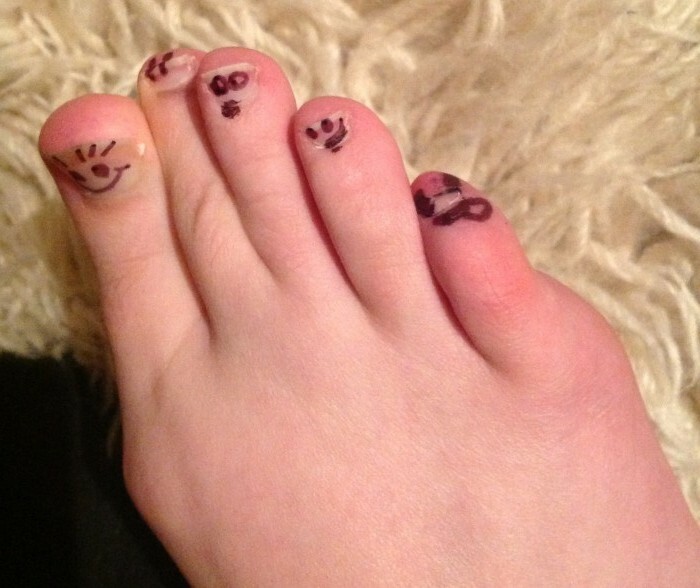 Here’s an adventure of smiley face big toes! 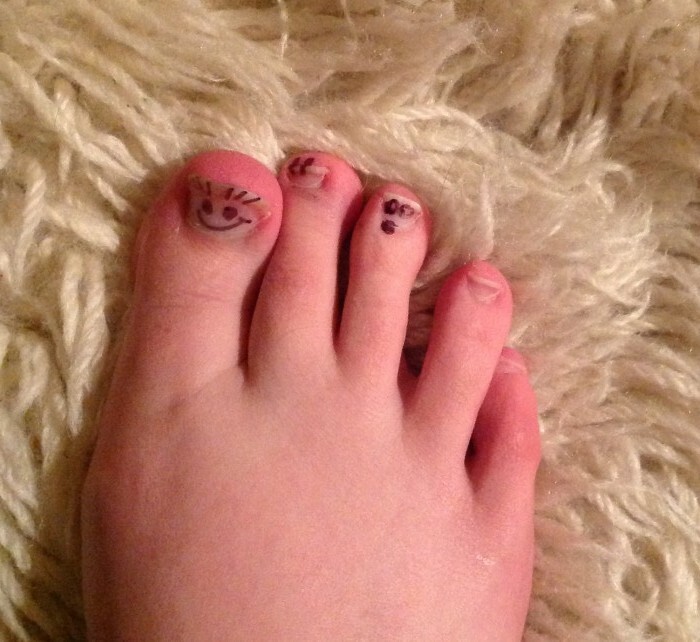 I make a smiley faced toe for you on my hallux (the name given to the Great Toe when dealing with tetrapods). 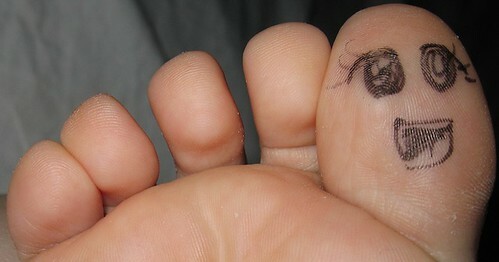 Second Toe is unimpressed by Great Toe shenanigans. 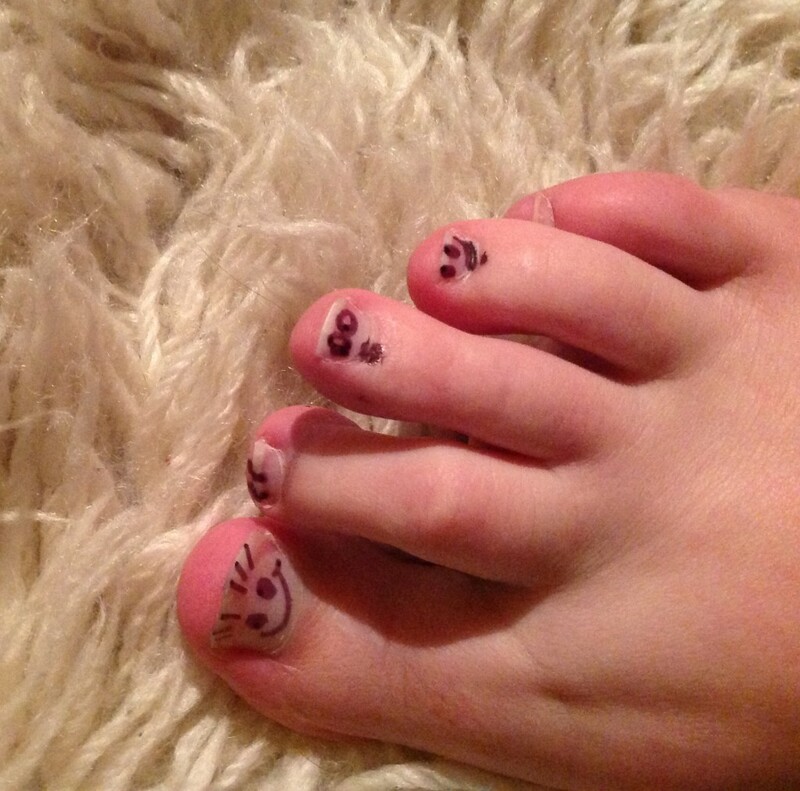 Middle Toe is shocked by the development of smiley faces on toughened keratin that sits on top of distal phalanges. Ring Toe finds the whole situation hilarious. 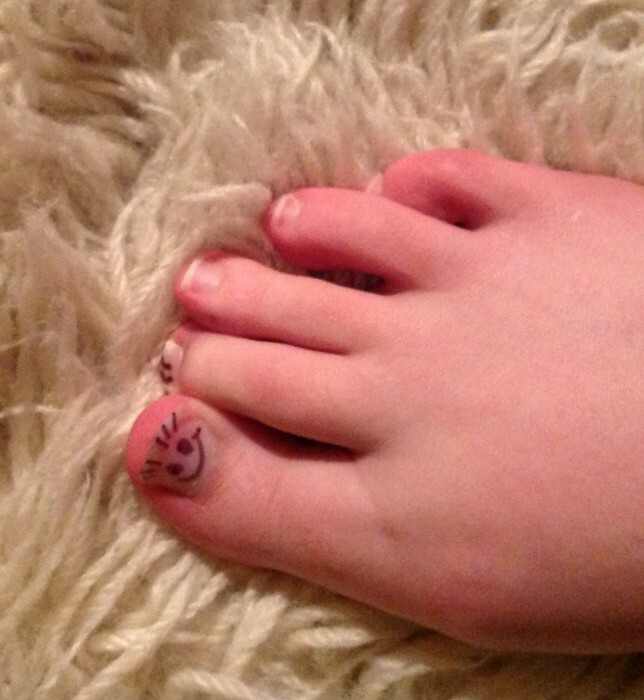 Ring Toe is a prankster, but we all knew that. 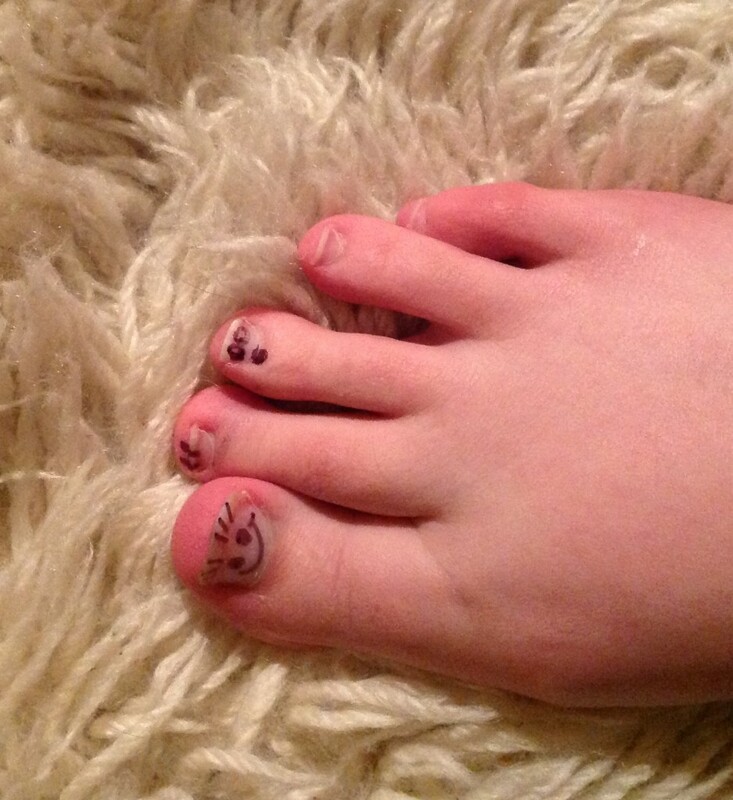 Pinky Toe is often confused, but pretends to get the joke. 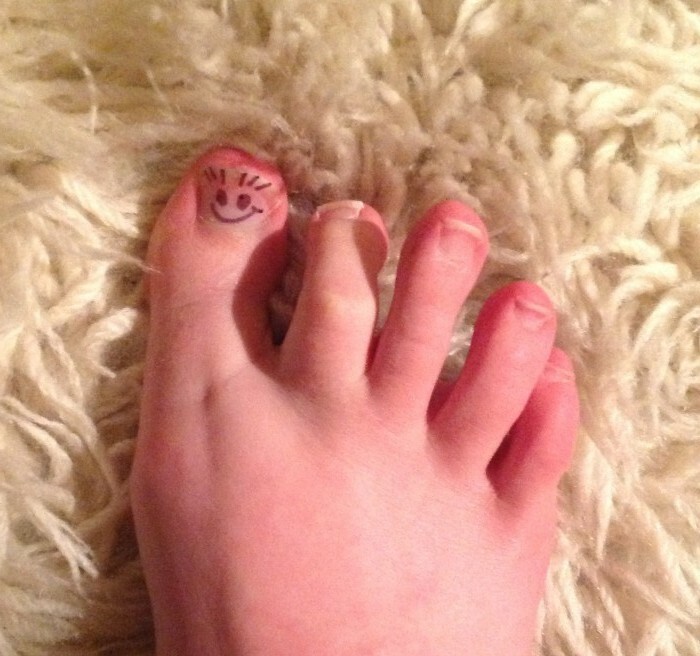 Pinky Toe sometimes gets left behind (owww). There will be a comic tomorrow! On Saturday I will be going to a wedding as well as derby practice in the morning. To make life easier you won’t get a comic on Saturday, you’ll get a comic on Friday! I just finished drawing it after a couple of days of feeling too tired to figure out how to do it. I’m excited, it’s inspired by another comic thingey I’m quite fond of, bet you can’t guess who! Website update and layout question. I’ve added buttons to facebook and twitter now that the Things have their own social media spaces. I worry about the pages becoming too cluttered, but of course I have developed a sentimental fondness for everything on the page. I’m wondering if I should reduce the number of project wonderful ads. I like having them there, it’s a way that I get to see some of the nifty comics out there and I like the idea of sharing the love with other creators. What do you think, do ads have an impact your enjoyment? Is the page becoming too cluttered? Are you cross that the ads have been pushed further down? The Things will now be updated on Mondays, Wednesdays and Fridays. Every second day was getting a bit too difficult to plan around. Would you like to be a super Things volunteer? 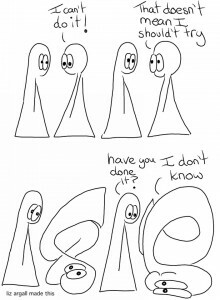 There’s lots of stuff that needs to be done when it comes to having a webcomic. Sometimes it gets a little overwhelming as a one woman operation. One thing that is a simple job and I should just be able to do is to write transcripts for each of the comics. That makes the comic more accessible for anyone vision impaired, has English as a language they struggle with or doesn’t like reading my handwriting. It should also create more written content that might help the Things show up on search engines. For some reason trying to do transcripts is really distracting in a way that makes it hard for me to draw comics! I would love a volunteer to write them up (the first 20 or so comics have transcripts if you want to see samples). You can either write it up in plain text and I’ll add or enter it straight into WordPress. Let me know if that tickles your fancy, as either a big one off project or a little bit here and there as you can manage it. For this you will get my love and appreciation, I’ll post you Things mini-comics (and possibly shrinky-dinks if I can make something pretty enough) and other yay you are a life saver stuff (TBA). If you want to commit to it on a regular basis I’ll create a special support staff page so we can appreciate your awesomeness sufficiently. If this interests you please email liz@lizargall.com and we can chat. Thank you!